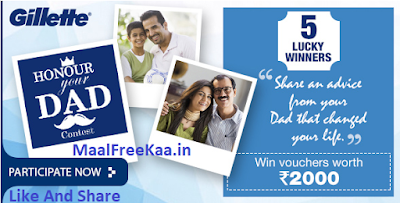 Father's Day Contest Participate and Win Free Gift Vouchers Worth Rs 2000. Share an Advice from your dad that changed your life MaalFreeKaa.in No. 1 Online Contest Free Sample Cashback Deal Offer Website Providing you best update about online shopping news. We Are Try to Share best Online Giveaway, Freebie Deal, Loot Free, And Much More. You Can Find All Online Shopping News, Play And Win Daily Freebie Laptop and Phone. Share an advice from your Dad that changed your life. If we love your advice, we will put it on our homepage banner! You will also win vouchers worth Rs. 2000/- For participating in the Honour your Dad Contest, individuals need to answer all questions 5 winners, for the duration of the contest, will be entitled to a Voucher worth INR 2000/- each, chosen by lucky draw from the pool of participants who answers all the questions correctly.